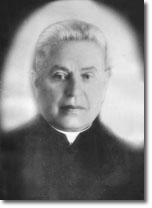 Anton Navolskyy arrived in Tluste around 1930 to succeed Teodozij Kurpiak as parish priest. Over the next four decades, he distinguished himself in the manner in which he served the entire community. One of his first tasks was to realise the completion of the Greek Catholic church, whose construction had begun in 1912, but languished for two decades because of insufficient funding. He managed to raise the necessary funds, and the exterior work was completed under his guidance in 1939. During the Nazi occupation of Tluste, between June 1941 and March 1944, Navolskyy also distinguished himself in a way that no one would have anticipated. The first two years of that period were marked by relentless persecution and killing of Jews in Tluste, culminating in the virtual extermination of the remaining population in mid-1943. While these atrocities were being committed all around him, Navolskyy sheltered Jews, at great risk to himself, hiding them in a shed and arranging for food to be brought to them. It is not known how many Jews Navolskky harboured during the war, saving them from near certain death; but his efforts were formally acknowledged by an inscription on a memorial wall at Yad Vashem in Israel. His courageous acts only came to light many years later, when people felt less insecure discussing the events of that period. Most townspeople were unaware of these acts of human decency that were occurring at the time. In the mid-1940s, under the new Soviet regime, Navolskyy faced a challenge of a completely different nature. 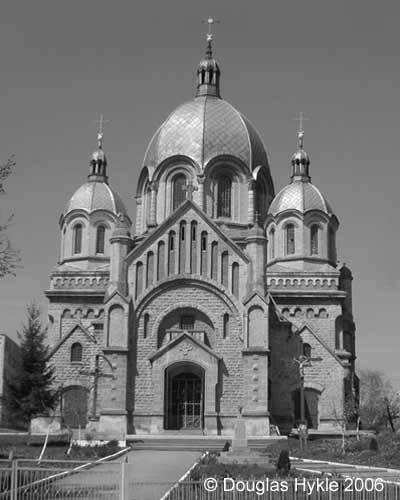 According to the resolutions of party bodies in Lviv on 8-10 March 1946, the decisions of the so-called Brest Union were cancelled and the Greek Catholic Church became subordinate to the Russian Orthodox Church. The Greek Catholic church of Tovste continued to function secretly through underground activities. Anton Navolskyy was allowed to conduct mass for some time, but in the 1950s he was relieved of his duties. When Anton Navolskyy died in 1965, his body lay in state in the Greek Catholic church in Tovste, and people flocked to the town from surrounding villages to mourn his passing. 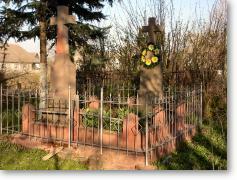 He is buried in the old Catholic cemetery in a well-maintained plot, next to the grave of his mother. Much more could be written about the life of Anton Navolskyy. This short article barely scratches the surface of his life’s work and selfless service on behalf of the community of Tluste/Tovste. Fortunately, Bogumila Berdychowska, Head of the Department for Cultural Development and International Cooperation, of Poland’s National Cultural Center, has written a more extensive article that was published in the newspaper Tygodnik Powszechny on 25 April 2004, entitled: “Requiem dla Antina Nawolskiego”. In due course, it is hoped that an English translation of the article can be arranged, so that more details of the life of this special man can be communicated to a wider audience. Pawlyk, J. History of Tovste. Chortkiv, 2000. and pers. comm.